NBA superstar Kevin Durant and the Thunder came up short in the NBA Finals last year, but he has a promising future and leads a quiet life as he seeks to walk closer with the Lord. When Kevin Durant signed an extension with the Oklahoma City Thunder on July 7, 2010, he did so with virtually no fanfare save an understated, yet highly grateful message to the fans via Twitter. That extension was later revealed to be for five years and roughly $86 million. Just one day later, and in stark contrast, LeBron James concluded a frenzy of media coverage and speculation that in some ways overshadowed the NBA Finals by announcing his “Decision” to leave the Cleveland Cavaliers for the Miami Heat on an hour-long ESPN television special. Those closest to Durant aren’t surprised that he chose to be low key despite playing in an era of huge, out-of-control egos. 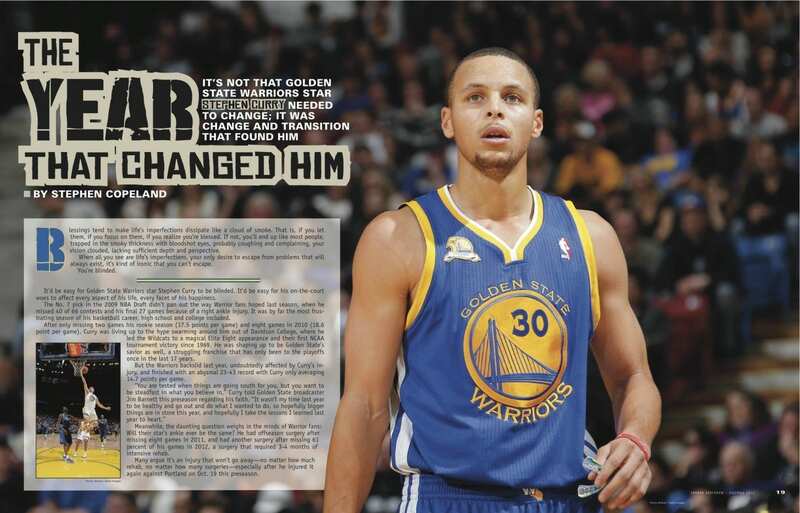 That’s because, in comparison, the 6-foot-9-inch small forward/shooting guard doesn’t have much of an ego at all. From a psychological standpoint, the first step in fixing a problem is admitting you actually have one. Maybe that’s where Durant has an edge on other self-indulgent sports stars. He actually understands the source of trouble and seeks out ways to avoid repeating the missteps of his peers. It might seem like a cliché, but for Maryland-native Durant, the concept of appreciating life is deeply rooted in reality. On April 30, 2005, Durant’s AAU coach Charles Craig was murdered in a gang-related case of mistaken identity. Ever since, he has worn the number 35 on his jersey in honor of Craig who was 35 years old at the time of his death. Durant’s uncanny ability to remain grounded and levelheaded can also be traced back to his family and a solid understanding of his Christian faith that was cultivated while attending a private school. And if any of those things fail, Durant knows he can always count on his family to get the job done. His mother, Wanda Pratt, was a post office security officer and his father, Wayne Pratt, worked for the Library of Congress. 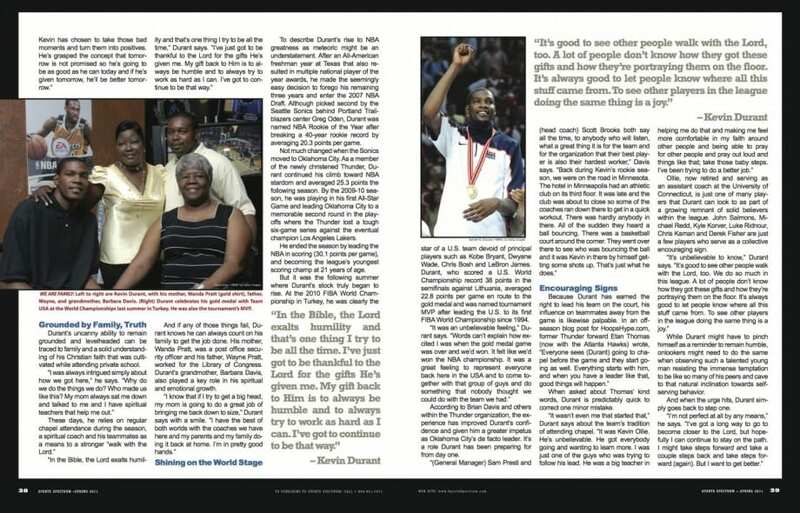 Durant’s grandmother, Barbara Davis, also played a key role in his spiritual and emotional growth. To describe Durant’s rise to NBA greatness as meteoric might be an understatement. After an All-American freshman year at Texas that also resulted in multiple national player of the year awards, he made the seemingly easy decision to forego his remaining three years and enter the 2007 NBA Draft. Although picked second by the Seattle Sonics behind Portland Trailblazers center Greg Oden, Durant was named NBA Rookie of the Year after breaking a 40-year rookie record by averaging 20.3 points per game. Not much changed when the Sonics moved to Oklahoma City. 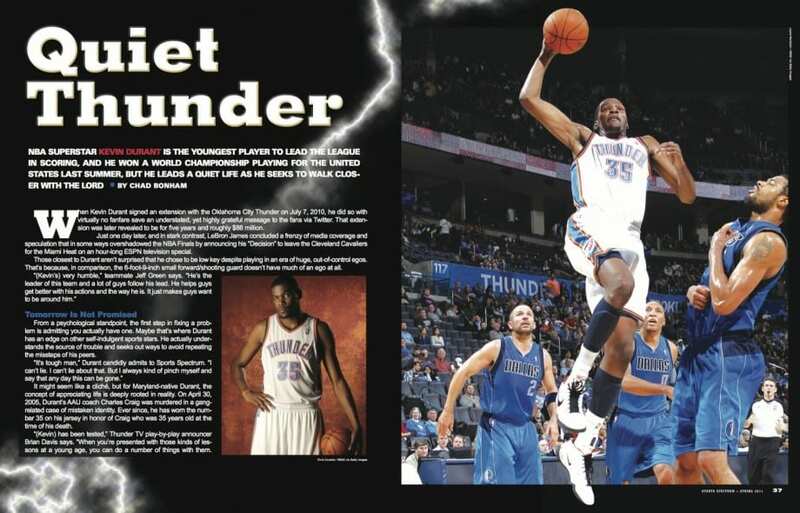 As a member of the newly christened Thunder, Durant continued his climb toward NBA stardom. By the 2009-10 season, he was playing in his first All-Star Game and leading Oklahoma City to a memorable second round in the playoffs where the Thunder lost a tough six-game series against the eventual champion Los Angeles Lakers. He ended the season by leading the NBA in scoring (30.1 points per game), and becoming the league’s youngest scoring champ at 21 years of age. But it was the following summer where Durant’s stock truly began to rise. At the 2010 FIBA World Championship in Turkey, he was clearly the star of a team devoid of Team USA’s principal players such as Kobe Bryant, Dwyane Wade, Chris Bosh and LeBron James. Durant, who scored a U.S. World Championship record 38 points in the semifinals against Lithuania, averaged 22.8 points per game en route to the gold medal and was named tournament MVP after leading the U.S. to its first FIBA World Championship since 1994. According to Brian Davis and others within the Thunder organization, the experience has improved Durant’s confidence and given him a greater impetus as Oklahoma City’s de facto leader. It’s a role Durant has been preparing for from day one. When asked about Thomas’ kind words, Durant is predictably quick to correct one minor mistake. Ollie, now retired and serving as an assistant coach at the University of Connecticut, is just one of many players that Durant can look to as part of a growing remnant of solid believers within the league. John Salmons, Michael Redd, Kyle Korver, Luke Ridnour, Chris Kaman and Derek Fisher are just a few players who serve as a collective encouraging sign. While Durant might have to pinch himself as a reminder to remain humble, onlookers might need to do the same when observing such a talented young man resisting the immense temptation to be like so many of his peers and cave to that natural inclination towards self-serving behavior. And when the urge hits, Durant simply goes back to step one. 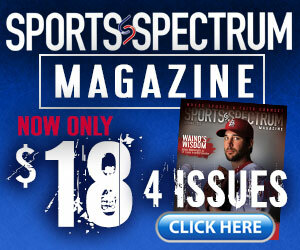 Kevin Durant was featured in the Spring 2011 issue of Sports Spectrum.